Two men were in the control tower of a Ralaarihsein base, one standing with binoculars, the other seated in front of a radar screen. Both had earpieces. The weather outside was warm and wet. Most of the traffic that was picked up by the pair were commercial aircraft flying south from Alharu to Dartha's main international airport which would use it as a refueling point before continuing their flights into the vastness of Thalassa. However, something else came up. Thake spoke up, "Mojer," he said, "can you take a look at this for a moment?" His colleague walked over to his console. He stared at it for a few seconds. "I do not recognize that identifier one bit," replied Thake. The other picked up his binoculars and looked out into the distance and could see the faint lights of the aircraft in the distance. "You should radio them." He nodded and turned to the unidentified aircraft's radio channel. "Unidentified aircraft, you are approaching restricted airspace. You will identify yourself immediately. Failure to comply will result in military intervention. You have ten seconds." Seven silent seconds pass. And then there is a voice on the other end that comes through on the radio. "This is Leopard 5, we have the Tagmatine Foreign Minister onboard. Requesting permission to land at Nelvanna Runway 22." Both looked at each other, stunned. The Rihannsu had barely communicated with the Tagmatines in hundreds of years, stemmed from their former client relationship many a generation in the past. "Please standby. Maintain current elevation and speed." Thake picked up a phone line that led straight to the base's operation center. "Tagmatine aircraft entering protected space. What do you want us to do?" On the other end of the phone was Nelvanna's commanding officer, Colonel Tovan Khev. "Scramble the fighters to intercept..." but before he could complete his sentence, he was interrupted by Jaridan Senator Tevus Pranana, the Republic's de facto Foreign Minister, who had just arrived to meet the mysterious aircraft, unknown to everyone at the facility. "That order is void. There will be no fighter scramble. Request the aircraft to confirm the following code." He took the phone out of the colonel's hands and into his own. "Tagmatine aircraft, confirm the following code sequence." The pilots on the plane flying above them relayed their response back to the ground. "It checks out," said Thake, Mojer nodded. "Leopard 5, permission to land is granted. Proceed to Runway 22." Back in Operations, Pranana gave the colonel a grim stare, indicating he'd probably be given a yelling by the Senate at a later date for such poor restraint. Before he left the room, he handed him a signed paper by the Praetor himself. "You're fortunate that I got here when I did, you did receive this instruction earlier this morning..." The commanding officer looked both ways in the room, looking for a subordinate to take the fall. Seeing none, he only remarked, "just don't make it happen again" and left the building. Outside, a Praetorian honor guard had lined up and the vehicles that would transport both him and their foreign guests were at the ready. The Senator was joined by General Korel Rendak, a veteran of the Enolian War. The general was perhaps one of only three people in the entire Republic to know that this fateful meeting was to occur and he wasn't too fond about it but kept his opinion to himself. In the distance, the Tagmatine aircraft had finally come in to land and taxied to the waiting crowd. As the plane came to a standstill, Senator Pranana remarked to General Rendak, "you are about to witness the first true interaction between us and them in nearly five hundred years." The aircraft's door opened after the airstairs had been put into position. The Leopard was now in the Realm of the Eagle. I'm sorry, we tried to commit genocide against your ancestors but we're cool now, right? It, ultimately, was a little more complex than that, as the shifting political balances of the world demanded that Tagmatium became more involved beyond the shores of the old world. But, the Megas Logothetes reflected, it did more or less boil down to it. It had been a long flight with an uncertain future in store at the destination and he had had a lot of time to think about it. He didn't doubt that the reaction of the Rihannsu would be hostile if word got out but they wouldn't do anything silly. A chime rang through the sound system of the small jet and the co-pilot's voice came through it. The sound of it broke through Eugenios Goulielmos' thoughts and he looked up from the sheaf of papers spread across the top of the table in front of him. The one had had been holding but not reading was on the shifting political alliances of the Rihannsu senate. The crew of the aircraft were all members of the Basilikoaeroporia, the Tagmatine air force, as was the aeroplane itself. It was painted in the livery of the air force and the black-banded red stripe along its sides indicated official service. Whilst its departure caused no comment in Arhomaneia, the distinctive colours would definitely do so if it landed at a civilian airport. The national flag painted on the tail made it abundantly clear where the jet was from. Goulielmos knew that this was the point where things stood a chance of going wrong. Where the level of secrecy could definitely backfire against him. If the Tello- Rihannsu Praetor had decided that it was no longer expedient for the meeting to take place, then the Tagmatine delegation could be ordered to turn back. At worst, it'd create a minor diplomatic spat about airspace being violated and the Agios Basilikon Kounsistorion left feeling as if it had been made a fool of. It would miss the only real chance that he felt that his country had to try to apologise for past actions. Of course, things could go really wrong. If one of the other political factions caught wind of the visit, then there was a chance that Praetor Terix could already have been toppled and the next few minutes might become even more uncertain. Whilst Senator Pranana had given the Tagmatine government assurances that the Rihannsu themselves held no true grudges over past, Goulielmos' own ministry and the intelligence service had indicated that there was still a deep feeling distrust and resentment towards Arhomaneia in some quarters of the Republic. The senator himself had used the word “conflict” in a communication with his Tagmatine counterpart – not a threat against Tagmatium but a reminder that the previous three Praetors had been murdered. Internecine political strife could flare up again. And the Megas Logothetes would prefer to avoid that. “They've granted us permission to land, Endoxotatos,” the air force officer reported, using the formal title for members of the Imperial Cabinet. “Sneaking in the back door,” muttered Eugenios, more to himself than any of the other occupants of the aircraft. The handful of other people besides Goulielmos was no where near the grand scale of entourage usually afforded a high-ranking minister of state on a visit to a foreign nation, done to overawe the barbaroi with the splendour of the heart of Eurth's civilisation. That would not have been the tone to re-start relations between the Megas Agios Basileia and the Republic. Instead, several aides from his own Logothesion and a senior member of the Arhomaniki Noimosyni Dykton were accompanying him to Rihan, as well as a pair of bodyguards from the household regiments. Even that had been a careful choice, designed not to offend the Rihannsu – three of the current regiments had been part of the army poised to drive them from the borders of Arhomaneia. The other three had either been on other duties or had yet to be formed. Of the two soldiers that had been dispatched from the latter units, one from the Arkhontogennhematai and one from the Ikanatoi, and they sat somewhat awkwardly in the opulent leather seats of the plane. They were already dressed in their ceremonial armour and Eugenios imaged it would be pretty uncomfortable. The two soldiers hadn't been dressed like that for the entire flight – that would have been very punishing, even though they were used to wearing the heavy armour whilst on duty around Tagmatika. They had changed as the delegation approached the Republic's airspace. They would be splashes of colour in amongst the sober suits. “I'm sure it's just a healthy sense of caution from the Tellosanoi,” replied said one of the aides with a smile. The Megas Logothetes looked up from the article he was starting at. He hadn't expected to be answered. He peered through his glasses at the man and gave him a slight shrug. The Tagmatine name for the Rihannsu derived from the name of the philosopher, Tellus, who started the events of the Departure. The Orthodox Church regarded him as a heresiarch who led his followers beyond the light of Christ. The original name for the ethnic group that were driven from the shores of Arhomaneia had fallen out of use as the event receded further and further into the past. When the Rihannsu were talked about, they were remembered as followers of a heresy who were rumoured to have ways similar to that of Arome. Nonetheless, the Foreign Ministry had worried that the name for them and their country, Tellosanon, would be considered derogatory, as it was given to them by their former oppressors. It was partially for that reason that there was no member of the clergy as part of the entourage, but also because of Pranana's urgings for secrecy. It meant that there was one less group of people that might leak the information. And leaks were on Tagmatika's mind after a foreign television station had announced news of meetings between Tagmatine officials and members of Greater Burlington's government. Whilst it wasn't secret, it had happened before the government had planned to release the information. And so it was a level of secrecy that the Agios Basilikon Kounsistorion was more than happy with. Rihan, after all, was a slaver nation, against which the Tagmatine government had been very vocal and even placed embargoes on those nations. This might be seen as hypocritical, abroad and at home. Goulielmos himself had reservations about just how far any talks would go. It seemed to him that all the caution meant that the people and, indeed, government of Tellosanon... Rihan needed to be brought around to it before they could go much further. He thought that Kommodos might have to concede that he couldn't expect any jump to open relations with the Republic wouldn't go down without grumbles from sectors of his own country, but he kept that to himself for the moment. The alert sounded throughout the cabin and lights indicating that all passengers should be sat and belted in blinked on. There was a quiet scraping of metal as the two guards put on the belts over their armour. It might have been more sensible to have had them wearing perhaps dress uniforms but there was no way that any amount of secrecy could truly stifle the typical Tagmatine arrogance, sense of superiority or obtrusive taste. “We're starting to land,” the co-pilot's voice. Goulielmos used his thumb to push his glasses back up his nose. He started to gather up the sheaf of papers in front of him as the aide who had spoken to him moved a briefcase forwards. The Megas Logothetes handed them over and sat back in his chair. It would be taken with the delegation but Eugenios doubted he'd look over it again, unless perhaps as reference material. It was assumed that the talks would take several days, but nothing like the state visit by the Asgeirrian leader. Their destination was still the Praetor's summer residence, so at least it wasn't going to be in some shady dockyard warehouse or something. That would certainly not befit the dignity of Arhomaneia, although Goulielmos smirked a bit at the mental image. There was a slight clunk as the airstairs were put into place. Suddenly, the otherwise-comfortable plane seemed very cramped. Goulielmos felt a flash of nervousness before he swallowed it. For good or bad, he was about to become the first ever Tagmatine to step onto land that it recognised as belonging to the Rihannsu. The foreign minister had been party to varying discussion from experts in protocol from his ministry, the diplomatic corps and other parts of the government about who should set foot on the ground first. It was quickly agreed that a Tagmatine soldier being the first one might be taken as a message of intent, and also showed a level of distrust towards their hosts. So, it was to be the Megas Logothetes himself. He got to his feet and was slightly surprised that they worked normally. The flight itself hadn't bothered him but he was beginning to feel claustrophobic and it didn't help that as he stood, the two guards started to follow him. The bodyguards stood behind the foreign minister as he waited to leave the aircraft. Both soldiers were slightly taller than the minister and a lot bulkier, in their platemail and carrying shields, although they stood far enough away to not knock him. As the door opened and he went through it, Goulielmos thought for a minute their shields would get stuck and these talks would get off to an embarrassing start. However, there was no crash from behind him as he walked down the steps towards the double line of Praetorian Guards. Presumably, they practised for exactly that sort of eventuality. These thoughts were lost to him as his foot hit the tarmac at the bottom of the steps. Senator Pranana and General Rendak stood side by side at the bottom of the airstairs, across from them was the Tagmatine Foreign Minister. The Senator was the first to speak, "Jolan'tru Daise'dæsnen (Greetings Foremost Minister), æfvadh i na Rheilhhu (be welcome to the Republic)." Realizing that his counterpart probably had a very, very faint understanding of the language, said the same statement in a more recognizable tongue. Both men nodded and shook hands. Rendak then shouted to the readied Praetorian Guards to be at attention, "Allhka! Pehai Anofv! (Soldiers, present weapons!)" The assembled men, totaling around 60, compiled, raising their Lirash polearms and angling them to form a roof-like structure. But it would be remiss if their expression was anything but grim. Such was their demeanor, the 4,500 best soldiers in the entire military had been given the sole duty of protecting the Praetor from harm, either on the battlefield or in public. Even then, there was always the Praetorians could, potentially, betray their charge. Terix knew that and had decided to raise their base pay by 25% and completely build their barracks within the larger Praetorian Palace complex to keep them in line. Hopefully, it would be enough to see him through for many years to come. "Minister," started Pranana, "I can confirm to you once more that the security of this meeting is still assured and no one other than myself, General Rendak, and the Praetor is aware of your presence here. The general eyed the two Tagmatine bodyguards. He like many in the military were never thrilled when foreigners would decide to use their own guards when the Praetorians were more than capable of doing their job in ensuring their protection while on their own land. He was about to say something but Pranana cut him off. "Dæus, urri'rau i Fvillha." Rendak responded "ie deihu (Yes senator)." The Senator then offered their guest to follow him and the general through the Honor guard. As they walked towards the end, both men came within sight of a waiting convoy of vehicles. "The Praetor insisted that we provided you with the best of luxury while you spent time in our beautiful land, please get in," he motioned him. "Your bodyguards will ride with my personal guards (Deleth) in the front car, while our contingent of ten Praetorians will follow from behind." The Praetorians continued to stare at their erstwhile colleagues as they got into the rear vehicle. He could tell the Tagmatine Minister was on edge, "do not worry, your safety is assured. We should get moving as the Praetor is expecting us at his residence in the Valley of Chula. If we get there soon enough, you'll have an opportunity to see a simply gorgeous sunset," everyone got into their assorted cars. As the car began to move away from the apron and towards the air force base's main gate, he felt relieved that at least the first five minutes of the Minister's time in the Republic hadn't gone off to a horrible start but both men knew that moment was the easiest, the real challenge lay ahead. If the general was unhappy with the presence of a pair of Tagmatine bodyguards, then he would have been down right appalled with the number that Tagmatium considered a Megas Logothetes entitled to – a company-sized number, to better inspire awe amongst the barbaroi, who could often be left in a state of wonderment at the splendour of Arhomaneia. Eugenios himself didn't notice General Rendak's annoyance, or at least deigned to pretend that he didn't notice it. Either way, he gave Senator Pranana a half-bow, the traditional Tagmatine gesture of greeting before taking the senator's offered hand. Shaking hands had never gained much traction within the Megas Agios Basileia, even if it was now common within diplomatic circles across Eurth. The words that the Tagmatine foreign minister said might seem little more than a pleasantry and somewhat trite, but Eugenios meant it. The brief smile he gave Pranana was also as genuine. He still couldn't quite shake off the feeling of being at the heart of history in the making and hoped that it would be for the better, for both countries. And the sight of the Praetorians putting their pole-arms together above the heads of the delegation and their welcoming committee was certainly very impressive, unlike anything that would take place in a similar ceremony in Tagmatium. He wasn't sure his own country would be able to resist pomp and ostentation for a secret meeting on their own soil. The two soldiers behind him watched impassively at the display by the Rihannsu soldiery, although that was always going to be the case – their closed sallet helms meant that nothing of their expressions could be seen, anyway. Nor was Goulielmos aware of the bribes that had been given to the Praetorians by Terix, at least not in a specific sense, beyond the knowledge that guards such as them needed to be kept favourable towards the ruler of a country as fractious as Rihan. Guard units close to the rulers of such countries often had a nasty habit of involving themselves in politics. The Republic was not unique in that fact – the same had been true of Tagmatium and many other nations across Eurth. That had been one of the reasons why the ancestors of the Rihannsu had been used as personal guards for the Agios Basileos, before their erstwhile employers turned on them. Foreigners were divorced enough from factional courtly politics that they could be relied on to guard their charges rather than indulge in regime change. The Tagmatines walked at Pranana's side down the alley of upraised spears. Eugenios nodded at the senator's assurances that the secrecy of the meeting had not been broken, although word would undoubtedly get out. The best that could be hoped for was that that happened after the meeting was over and drawn to a conclusion that was satisfactory to both sides. The rest of the delegation followed in the wake of the two foreign ministers. The two aides tried to keep expressions of solemn dignity on their faces as they trailed behind Goulielmos and Pranana, whilst the spy just had one of insouciance – her cover story, such as it was, was to act as something of a cultural observer and advisor to the Megas Logothetes whilst trying to absorb information that might be considered interesting to her organisation, in a way that did not violate the terms of the meeting or offend their hosts. And, in a way, the cover was true – the isolationist stance of Rihan over the previous years meant that much of what had taken place within its borders was not well known by outsiders. Especially Tagmatine ones. Any information that could be gathered would help to fill in the blanks that the AND had not been able to fill from second-hand sources. She was the only one who was aware enough to wince slightly when Eugenios invoked the blessings of a deity that the Rihannsu didn't believe in, and the ecclesiastics of which played a key role in the Departure. The other two at least were able to suppress the instinct to cross themselves, as they had been repeatedly warned about any overt displays of religion whilst within the Republic. Privately, as he climbed into the car alongside Pranana, Eugenios wished that it wouldn't be considered below the dignity of a member of the Agios Basilikon Kounsistorion to a take a picture with their phone's camera, like an ordinary tourist. He was sure that his wife and children would love to see the sunset that the Senator mentioned. At best, either one of his aides might take a snatched picture through a moving car's window. It would likely not win any photography prizes. He sighed internally as he did up his seatbelt. Without a word from the Tagmatine minister, the Ikanatos and the Arkhontogennhemates detached themselves from their charge and made to follow the Deleth of Pranana. The pair had been hand-picked by their respective superiors as exemplars of their units and it was interesting to see the contrasts and the similarities they had to the Praetorians, beyond the ostentatious ceremonial uniforms that all three of the guard units had. Hopefully, some space could be found for the Tagmatines' shields in the boot of the lead vehicle or there would be a moment of absurdity as they scurried back to the aeroplane to put them back on board. The convoy had left Nelvanna Air Force Base and was en route to the Valley of Chula. The route the cars had taken passed under a clear, blue sky; and beside tall stalks of grain waving in the fields, others with abundant fruits and olives growing on trees. They were driving through the Aihai, the great plains on the outskirts of the capital, Dartha. The Aihai was also one of the most populated areas of the Republic. "A beautiful sight Minister?" he asked. Pranana never tired of it. Another field came up and he could see people working the land. Harvest season was approaching. "A good harvest is expected and the bounty seen in the fields seem to confirm the estimates the Agricultural Ministry predicted," he commented. They began to climb into a series of hills. Pranana leaned over to his guest. "Minister, there are a few things I want to show you," he said. He instructed the driver to pull over. Senator Pranana's Deleth and his guest's bodyguards took up positions while the two men look into the vista. "You see that shimming white dot on the horizon?" he asked. "That is Dartha, the capital." In front of him was the expanse of the Aihai - small and medium-sized communities could be seen, and in the faint edge, the suburbs of the capital. But it was the vibrancy of the agricultural breadbasket before him that stood out most. "650 years ago, this was wilderness. We tamed the land. We've thrived." He then pointed to the northwest, "in the distance in this direction is the city of Raxna," and then he turned them both to the southeast, "that forest, far in the distance, is the greatest of nature and wildlife reserves: the Vanawar," and then to the foreboding geography to the north of them. "That is where we are going," he commented. The cars climbed into the Valley. Flying above them was a majestic Mogai, Tevus noticed it as it glided down into the valley below them. "Majestic birds," he said, "soaring with pride. They are our symbol of might and strength. It is one of the reasons we adopted it as our standard," he finished. They would weave alongside the edge of cliffs and climb ever higher until a large complex of buildings appeared on the horizon. "Ah, we're here," the Foreign Minister proclaimed. "The Praetor is expecting us," he said. Above, the sun showed signs that it would set in the near future. Eventually, they stopped - in front of the complex's main gate. "Abrai Itæru. Bærhiedæsnen khir na Fvillnu." The Praetorians on duty opened the gate and allowed them. The convoy circle in front of the main building - equally as impressive as the Praetor's Palace in the center of Dartha, built in ornate marble imported from Kedossia and native materials from the Valley and across the Republic. Praetorians stood at both sides of the staircase. A pair of horns announced the presence of the Praetor, the embodiment of the Republic. "Megas Logothetes﻿ Goulielmos﻿﻿," said the man, "I welcome you to my home, to the Valley of Chula, and of all, the Republic. I hope your flight wasn't too painful and the ride up here was pleasant," he remarked. "Ah," he exclaimed, the sunset had begun, "before we continue, follow me. You must see this sunset for yourself. Unlike anything seen elsewhere on Eurth," he offered the Minister to follow him to a viewing platform to one side of the complex, on the edge of a cliff. "Watch." A beautiful array of colors and variable shades illuminated the sky, the yellow-orange tinge sun cresting over the cliffs across from them. The stars appeared, bright, unhindered from the light pollution of Dartha or Rihan's other large cities. This had gone on for over ten minutes. "I always take time to watch nature, give a momentary pause from leading the Republic," remarked Terix to his new guest. "The sun has finished his business, but ours is just beginning. My cooks have been busy at work to prepare a wonderful dinner for the two of us. I imagine you're quite hungry after a long flight from the other side of the world. Please, follow me," he said. Both men walk through the front lawns of the complex, across the stone cricle drive, and up the staircase, into the vast Palace complex. Smiling slightly, more to himself than Pranana, Goulielmos nodded at the Senator's comment of the rolling plains of grain and the fruitful olive trees. It was definitely a very pretty view and clearly tailored to give him and his small entourage a certain impression about Rihan. The Megas Logothetes could not fault it. It was as much a propagandistic display as being given a tour around busy factories or the bustling heart of a city. He would have done exactly the same in the Senator's shoes. And, considering Tagmatium's climate and preferred foods, it would have likely been almost exactly the same view, too. Although he might have chosen to have agricultural machinery rather than people in the fields but the effective would have been the same. The Tagmatine minister looked out of the corner of his eye at the AND agent – she was discretely taking notes on what the Senator was saying about the Rihannsu agricultural ministry. And, likely, the amount of people working in the fields. They were probably slaves, after all. Eugenios couldn't stop the intelligence agent from reporting that to her superiors, sadly. He guessed that slavery would become a stumbling block in the future. The journey continued to be very picturesque and Eugenios knew that he would definitely regret not being able to take any images of it home to his family. They would have loved to have seen this. Perhaps if relations between the Republic and the Megas Agios Basileia were to properly become normalised, he and Pranana would be able to have an official meeting. They could go through these motions again and Goulielmos would probably have to have acting lessons in order to maintain a convincing look of amazement at the vistas for the cameras that would undoubtedly follow the first official historic meeting between the two nations. “The view is certainly incredibly beautiful, Senator,” said the Tagmatine. He wondered if he could detect a slight hint of something to Pranana's words. Triumph, perhaps? Maybe a touch of accusation – Just think of what we could have achieved if we had stayed. It did seem that the Tellosanoi had achieved much since the Departure and they likely would not have been given the same level of freedom with they had remained within Arhomaneia. Likely, they would have had to have kept to the lands allotted to them by the Agios Basilikon Kounsistorion, or even have been moved internally to an area thought to be at threat from barbarian invasion. Best not to mention that sort of thing. It' would be very undiplomatic to do so. The eagles were a great touch. If Eugenios was as cynical as Honorios Kontarian, the Megas Logothetes for War and his good friend, he might have suggested that they had been purposefully released in order to provide for this moment, as this sort of diplomacy was as much about theatrics as it was anything else. Having to try to herd some leopards into the right place would be a nightmare. And the Tagmatine didn't really like them, nasty bitey things that did kill more than a handful of people every year. The Rihannsu probably didn't have that problem with eagles. The sun was beginning to set as the cars drew up to the Praetor's palace and the Megas Logothetes remembered that Pranana had specifically mentioned the beauty of the sunsets in this part of the Republic. The building was awe-inspiring, a suitable home for the proud leader of a nation. The thought of how many Praetors had met their end here flashed through Eugenios' head and he suppressed it. If word of his own visit got out, then he hoped he wouldn't go the same way. Two bodyguards with just ceremonial, if completely functional, swords would not make much of an impact. What definitely did make an impact was the honour guard that stood at the ready at the bottom of the staircase. Horns blared, announcing the presence of the Praetor himself. Eugenios stood straighter and brushed the sides of his suit down, hoping that it was not too creased from sitting in the car from the airport. He gave the Praetor the half-bow and straightened up before speaking. “Praetor Terix, I am honoured to be here and representing Arhomaneia.The Agios Basileos kai Autokrator himself sends his greeting and hopes to one day meet with you in person.” He gave Terix a polite smile. Doing as Terix gestured, Goulielmos followed him to the viewing platform and looked towards the west. Both men were silent for the next ten minutes as the sun sank below the horizon. It was as breathtaking a sight as both Pranana and the Praetor had suggested. Neither had really got across how beautiful it was and the fact that this was the first sunset the Tagmatine had seen south of the equator, on a continent he had never stepped foot on before, added to the occasion. He could see why Terix would want to stop and set aside the cares of running a country for a brief moment, when this was what could be seen. Few aspects of politics could be as rewarding as just watching the sun slip out of sight. Dinner was served: Checca stew, Osol fish, and wild Hlai. Both men were given a vintage Kavit, a smooth wine produced in Rihan on the Praetor's own private lands and had gained further popularity abroad. To conclude, a sweet Sesketh cake was presented. He could tell his guest was largely satisfied with the meal if not still getting around the relatively foreign menu. To not completely mess with his Tagmatine palette, fine pastries from his homeland were baked to accompany their meeting. How they had received the recipes for the delicacies, let alone the more 'unique' ingredients had come through the Trading Corporation by way of an independent merchant who regularly traveled throughout the Ragos Sea in Europa. Senator Pranana had also joined them. Their meals were being taken away, "I hope you enjoyed it," Mathon said as one of his attendants approached. "Daise, I have prepared the pastries and coffee for you and the Tagmatine Minister on the second floor Vathua overlooking the view of the Tor'ren Falls." Terix nodded to him. "Thank you, you are excused," he began to get up, as was his guest. "We will take the long way round to the opposite staircase," he said, a pair of Praetorians and the Tagmatines' guards had taken up their position. Although they were within the confines of the Palace, it was still standard procedure when a foreign guest was present for the protective units to be with their persons when moving from room to room. They proceeded to leave the dining hall and into one of the hallways. Tevus excused himself, allowing the Praetor to meet with the Tagmatine one-on-one. He himself had a busy day tomorrow involving his guest and so decided to go to bed early. He was aware of what Terix was going to discuss with him. Both men passed by walls dressed in tapestries, hundred-year-old pieces of artwork, and elegant statues, including those from the very early days of Rihannsu habitation. They would walk by dozens of these works until Terix stopped him in front of a locked, glass casing. Inside was one of only four remaining copies of the original Na Temyytæra ('The Departure) written by one of Tellius' closest friends outlining their reasons for their disagreements with the Tagmatines those hundreds of years ago and what lead to their flight. Beside it was an equally as old tome: D'hwæl (Great Journey), the comprehensive twenty-year period in which the Rihannsu sailed from Europa, across the Adlantic - then known as the Great Ocean - and along the shores of the New World, including chapters on the peoples they met, interacted with, and at times, fought with. It was perhaps one of the most important literary works ever written besides the Bible, the Rihan Republic's constitution, the D'Vatta (Great Document), and an assortment of stories by authors of renown. "You are the first Tagmatine in five hundred or more years to gaze upon these tomes. I am sure you and others would be quite intrigued by their contents," he said. "But enough sightseeing, we have much to talk about," he finished. Goulielmos and Terix ascended the marble staircase at the back of the palace and entered the lavish lounge. The guards, from both men, took up their positions on either side of the double doors. Inside the room, as promised, the coffee and the pastries were on a table. Two comfortable curule chairs, in the same style as those, sat upon by members of the Continuing Committee in the Senate chamber, were prepared with soft cushions. It was quite dark outside but the moon shone brightly in the night sky, illuminating the cascading waterfall just beyond the Palace. The Tor'ren River, a waterway that fed into the larger Sherdek River, could be heard faintly. All was peaceful. Terix entered the room first and saw the attendant. "You are dismissed. I shall call for you when I need you," he instructed. The humble man excused himself and left out a side door. They got seated as Terix poured himself and his guest a cup of coffee. "I am sure you will find this quite familiar, fine coffee from Mauridiviah," he commented as he finished and got comfortable in his seat. "I am sure you've had enough of us trying to boost our egos and I certainly didn't invite you to just gaze upon our beautiful land or to enjoy a meal. No, no," he paused, "I instructed Pranana to convey my original message because I wanted to talk with you, seriously." He took a sip of his coffee, "It has been over six-hundred years since there was a proper meeting between either one of our people. And mind you, as we both are aware of our joint history, it wasn't a pleasant one. But," he was being cautious with his words, "it is time to talk once more. I do not expect this meeting to be easy, for it was, neither of us would be talking - and this conversation would have simply remained between two low-level members of our diplomatic staffs and perhaps we'd hear about if the information was intrigued enough for our attention." He took another sip of his coffee. "As with the change of the world, so do the complications of interactions between peoples. The Republic cannot maintain its traditional approach to diplomacy. Along with our whole mentality must shift. Within reason." The meal was as delicious as the Praetor had suggested, if a little odd on Goulielmos' palate. The dishes were unfamiliar, as could be expected for a country so far away. Fleetingly, the Tagmatine had wondered if the Rihannsu would pull the old trick of giving the foreigner something like sheep's eyeballs to see what they could get him to eat. But this wasn't a public arena and if Terix was doing that, then it would display him as an odd sort of sadist. Which he clearly wasn't, as Goulielmos' hosts had gone to the trouble of preparing the odd item that he would find familiar, demonstrating that the Rihannsu were keen on operating in good faith. At least at the moment. “It was a very fine meal, Praetor,” said Eugenios, although after the long flight and the lengthy car journey, he'd probably have eaten almost anything put before him. As Terix rose to his feet, Eugenios did the same and obediently followed the Rihannsu as he led the way. He noticed that his bodyguards were still around and he gave them a nod of greeting as he passed them. Not that either would acknowledge it, impassive in their blank helmets. The Megas Logothetes always felt it to be proper to be polite to them, at the very least. They weren't living furniture, after all, and they were charged with defending his life. The works of art that Terix took him past were impressive, although the Megas Logothetes was no art historian but he could certainly appreciate that he was seeing something that no other Tagmatine had done before. There would be many in Arhomaneia who would kill to be able to look at them and, if all went well, perhaps they might be able to look upon ones similar. And the books... All of the copies of the Na Temyytaera that the Tagmatines had got their hands on eight hundred years ago had been burned and those that possessed them imprisoned or hanged. There was supposedly one copy was locked up within the bowels of the Megale Ekklesia, the Great Church, in Tagmatika, along with a great many other heretical books, although a layman like Eugenios wasn't aware of that. The Megas Logothetes wasn't disappointed when Terix cut their sightseeing short – after all, they had business to get down to. He made a mental note to see if the Rihannsu would allow him to take a copy of at least the D'hwael back with him. Taking a copy of a book considered to be heretical would be pretty much a bad idea. The Church would bow to pragmatism when it came to the Megas Agios Basileos opening relations with a group it branded as heretics – after all, most other Christian states were basically heretics, too. But effectively smuggling a banned text into Tagmatium would likely be a step too far. The walk through the rest of the palace was equally illuminating. Like Arhomaneia, but not. The Tagmatine wondered whether style was a conscious decision on the part of the Rihannsu, invoking a lost homeland and a future path that was now out of reach, or just an echo of folk memories. He decided to keep that musing train of thought to himself, in fear of offending Terix. The Praetor seemed reasonable and remarkably open-minded, from what Eugenios had seen so far, but the Tagmatine did not intend to push his host. The guards that had been following them at a discrete distance halted behind them at the next doorway as the Praetor led the Megas Logothetes into the lounge. The Ikanatos and the Arkhontogennhemates would have stories to tell to their comrades once they were back in Tagmatium. Terix and Eugenios lowered themselves into the chairs and the remaining servants cleared from the room. To business at last thought Eugenios, although not rudely. He picked up his coffee and took a small sip, just to wet his mouth. Terix's comment that the whole of his nation's mentality needed to shift, even with the caveat, was very intriguing. Like many other nations, the Rihan Republic had been isolationist until, well, the last few months. On the face of it, if Tagmatium had not the shared history with the Rihannsu, then the Megas Logothetes doubted that they would be having this meeting – his nation just would not really have been interested. It would be going as with the Aluxians and a dozen or so others; a tentative greeting, the exchange of diplomatic missions and going with the flow from there, or perhaps nothing more. He smiled slightly again, heralding another weak joke. “Perhaps by being so clandestine, we make it look as if we're guilty of something when we are not. "I do not expect the Empire to completely wipe away history and assume that all is well - that the history of the past was nothing more than an illusion. I think it is fair to say that we both recognize that the events that transpired were from a period of time that both my own people were still developing their actual place in the universe and the ongoing orientation of Tagmatika moving forward from the ashes of the Aroman Empire of Old. We were nothing but one of the hundreds of warring peoples from the Central Europan Steppe only to be pushed into the West by other likeminded peoples. Even under the Tagmatine Emperors, and with our past arrangement, it was still foreign." "But history is history, and we must respect it. Even in the worst of events," he paused. "It is the same history that we meet under. Right now, as you've mentioned, we meet removed from others. I did this not to admit guilt nor force you to do so to save face, but because there are genuine concerns. The passage of time is vast. Many a noble lineage here harken back to the days of the Departure, some even further back to the very earliest of recorded days. However, the Rihannsu may long memories and hold vendettas against their fellow aristocrats when it suits their interests, they know the world is changing. I know it is too." "The road will be long," he lamented. "I do not expect the climb to be easy or without setbacks but I firmly believe, and there are others in the Senate, namely those who subscribe to the Suketh alignment, who believe we must shed away some of the paranoia and stigmatism of foreigners and embrace international cooperation. While I may not agree with them on some of their values, I do share their concern when it comes to the Republic's relationship with the global community. We cannot remain isolated. Nor remain isolated and brood." Mathon, a man with a longstanding career in the navy, was saying things that many Jaridan or Jol Tan aligned senators would utter. "I asked for the secrecy of this meeting because I want this effort to succeed over the long-term through measured, cautious movement that can be undertaken without prescription of causing headaches for either of us." Terix imagined they were speaking on the same level but even he was being careful with Arhomaneiahis words around Eugenios. He picked up the coffee pot that was at the center of the table and poured himself another cup, took a sip and continued on. "I fundamentally believe there is a way to move our shared history in a positive direction, setting us both up a better future," he adjusted himself in his curule chair, put down his cup. "Perhaps not a formal embassy nor consulate - the establishment of diplomatic missions both here in Rihan and Tagmatium, led by representatives deemed acceptable to each party." "Beyond that," he started, "to begin healing, we must learn from each other, break down barriers and stigmas." He wasn't so sure the Tagmatine Minister would go along with his next suggestion but he decided to take a step forward. "Perhaps," pausing, "a limited cultural exchange could be arranged to test the waters and if successful, a larger 'opening' for more from each people a chance to see the wonders of Tagmatium and the mystery of Rihan." Eugenios followed Terix's lead and slowly sipped from his cup, less for the fact that he was particularly wanted a drink than to give himself pause for thought. He was much happier with coffee than the tea that pervaded the Megas Agios Basileia – it was a taste of foreign lands, rather than the relatively stilted and hidebound Arhomaneia. And Mauridivian coffee was perhaps considered amongst the best that could be got within Tagmatium. It was certainly prized more highly than a lot of the Europan equivalents. Perhaps that was merely because it came from further away. A limited cultural exchange... It would certainly be an interesting idea. Many countries did have cultural organisations in other nations, often working alongside diplomatic missions, to act in the way Praetor Terix was suggesting. However, Eugenios supposed, most other countries, the vaguely civilised ones that is, didn't have the same historical background as Rihannsu and Arhomaneia did. There were similar examples of countries possessing at least the same dynamic across the New World, although the complete lack of relations and determined ignoring between the two had no real parallel in any other nations. In all honestly, the Megas Logothetes suspected that it might be a bigger issue for the Rihannsu that the Arhomaioi. The Church would probably throw a bit of a hissy fit but that would likely be for appearances' sake more than actual dislike of Rihan or its people. After all, the threat of heretics and apostates was bigger than heathens – the former were twisting the teachings of Christ whilst the latter were just ignorant. And, Eugenios supposed, if any of the Tellosanoi were exposed to True Religion, then there was the chance that the Church might find converts amongst the otherwise-atheistic population of the Aurelian nation. Even if they had been at the forefront of the calls to annihilate the followers of Tellos in the past. “And, as a foreign minister, I can only agree with what you say that this Suketh alignment says. And as a biased foreigner that might stand to gain prestige in the eyes of his own monarch if he is successful in the mission that he has been entrusted with, too,” the Megas Logothetes continued, with a degree of self-depreciating humour. The edge of humour disappeared and Eugenios' face became serious. “No country remains isolated without suffering for it, whether directly or indirectly – political and economic marginalisation are the result and this would basically be what amounts to self-harm. You have a continent spread before you, however, and friendly relationships further afield couldn't hurt, either. As your foreign intelligence services would have undoubtedly shown you, the continent of Europa is full of isolationist or collapsing nations and both Arhomaneia and Adaptus came out of recent periods of such; the world almost past us by. The Megas Logothetes thought for a moment before continuing. “I apologise for sounding a bit flippant there, Praetor. I can see that almost any option that we table at the moment may well have its opponents and in virtually any form that it might take. Whilst I don't think that there are Arhomaioi that are quite so vehement in opposition to Rihan visiting their country as there are Rihannsu to Arhomaneia, there will be those who will be against in on religious grounds, or even on principal. Yours, after all, is regarded as a barbarian nation – and one whose people tried to instigate a rebellion in God's chosen nation. Mathon paid attention to every single word Eugenios had said. "A mission sounds modest but there is nothing saying it couldn't elevate to a proper embassy in due time. I merely propose such a minor step in the name of protecting both my own actions here in Rihan and for the Emperor who I am sure will have to deal with some level of criticism from the Church that doesn't exactly...approve of us. I think the cultural exchange is a good mechanism to test the waters under the auspices of a proper arrangement and if successful, it would warrant much more 'coordinated' deliberations." "I may need the militant Jaridan and the deviously wealthy Nej'ahar to get many of my proposals through but when they consist of men and woman who would rather take a blunt approach to solve a problem - either through the barrel of a rifle or through the sacks of money - it isn't always the right method. Now, as you are aware, I am a military man myself, a long career in the Navy before being appointed the Praetorship, this sounds counter. I may be a political man now, and surely you may not believe what I am about to say but I never 'clawed' for the position. I accepted it because it was my duty to serve. I do not formally pronounce my political alignments in the Senate in the name of safeguarding the Republic - above all. The Suketh may be a small contingent of the Senate membership, they are right. I privately consulted many of them in the early days of my tenure - and this meeting is the product of such discussion and debate." "Rihan may be as far away as the rest of Eurth and it some ways, that is a good thing in the name of maintaining the stability of the Republic, but as you said, no one nation survives on its own. Since my ascention to the position, I've taken far greater steps at continental affairs than many Praetors before me, only concerning themselves with Aurelia overall when there was a situation that was too...complex for our own address. Today, the Rihannsu and Kirvinska are as close as we've ever been. The Phi'Tlaru has been quite useful in probing the wider globe in keeping us abreast of developments abroad. I do respect Arhomaneia cause of keeping Europa at least at some level of stability," another boost few other Praetors would say unless it was meant to get something, "and I am aware of a great many things many governments would not like us to know," he gave a slight chuckle. "In regards to the cultural exchange," he moved towards the first trigger that would reconnect former complements, "the definitive program would probably center around nationally-sponsored trips. I'd like to say we could do an exposition but I have the sense that many in the Church who may want to suppress some of our 'creativity' but I think you can work out the final format with Senator Pranana and the Civilization Minister. Obviously embarking on this type of arrangement would involve some revisions in visa policy between us and the establishment of protocols that our two nations would uphold in the spirit of making this a success." He knew Eugenios would bring up the one difficulty in pulling such an exchange up. "You do not need to apologize for being flippant," he began, "I don't think these exchanges would be quite so 'popular' but perhaps targeting them to particularly 'enlightened' individuals - academics, of culture. Yes, there will be detractors, as will be the case here, but nothing should stop us from making a complete attempt. And I am prepared to spend political capital to make it happen. I am by far a more liberal politician than you may find in the Senate. Yes, the three-hundred men and woman of the chamber will be a challenge. But I've succeeded in getting numerous reforms through in some rather unconventional ways." Terix had noticed at this point that the coffee pot was empty following Eugenios' pouring a final cup. Mathon quickly moved it out of the way to a side table. "It will be hard. But," he paused, leaning back in his chair, templing his hands, making his guest curious about the hand gesture. "Recognition must happen. And it will happen." The clock, placed on the opposite of the room, struck ten. The moon shined brightly in the sky, the crescent fully visible in the cloudless night. The Praetor might say that he had accepted his office on sufferance and cast aside his own political affiliations for the good of his country, and who was the Megas Logothetes to argue? Eugenios was reminded of part of the coronation ceremony of the Agios Basileos – the person elected to the office would be called upon three times to take up the role and would turn it down the first two times, proclaiming themselves unworthy of the exalted office. On the third time, they would accept. He didn't know enough about Terix to truly judge whether the man was being honest with that statement that he hadn't clawed his way to power, but it didn't really matter, he supposed. What did matter was that Terix was in the position to start to improve the relations between Rihan and Tagmatium. When the Praetor leant back in his chair and put his fingers together, Goulielmos suppressed a smile. The gesture was possibly unconscious and psychologists often said that signified that a person was confident – as well as being a pose that Kommodos often took. The Praetor and the Agios Basileos kai Autokrator were very different people, as it seemed that Terix had to take into account the wishes of a powerful Senate, whilst Kommodos ruled in the manner that his title suggested – an autocrat. The suppression of the Tagmatine senate in the aftermath of the 2005 Civil War might well be something that Terix dreamed of replicating on occasion. If the Rihannsu and Arhomaniki rulers ever met on personal terms, Eugenios doubted that they would get on all that well. As the clock struck the hour, the Arhomaios minister resisted the urge to look at his wristwatch out of habit at the chimes. He wasn't feeling all that tired, despite the busy day and meeting with the Rihannsu leader. A whimsical part of him was indulgent enough to think it was because the pair of them were forging history. It was actually likely because of the numerous cups of coffee that he had drunk. “Unless the situation changes on the world scene dramatically, or either of our nations do something that makes it politically untenable, only then can I see any recognition between our nations not happening,” replied Eugenios. The emphatic nature of Terix's words, the drama he seemed to invest in them, struck the foreign minister as a little hammy. But everyone had their own quirks and so far the Praetor seemed to be a man of integrity and sense. If he wanted to play somewhat to an invisible audience, then Megas Logothetes was prepared to let him. So far, the Tellosanos had been perfectly hospitable and certainly Terix was very keen to heal the rift between the republic and the empire. Hopefully that wasn't too much of a puncture to Terix's mood but it would have to be surmounted before dealings between the two nations could improve. And it wasn't like Arhomaneia had much leverage over Rihan to try to force the issue, like the embargo that was in place against Derthalen. After all, that would defeat the entire point of a careful warming of relations that was being planning in the Valley of Chula. But it was not as if Tagmatium had allied or worked with nations and governments it would otherwise be opposed to in the past. There was a reason that Arhomaneia had garnered the nickname of “Pragmatium” in some of the Anglish-speaking nations. The Rihannsu would likely be no different in this regard than many others. Perhaps even the mystique of the past history and interaction between the two nations could work in their favour. It was a good job that Agios Basileos kai Autokrator had a propaganda ministry, the Logothesion ton Deeseon, for just this sort of occasion. The minister in charge was an archbishop, so there could well be a conflict of interests, if the Church really wanted to make the situation awkward for Kommodos. Not often, however. At least, they didn't make it past the censors of the Logothesion ton Deeseon with much regularity. And then the Esoteriki Epitheorisi Pliroforion, the secret police, might get involved, much to any author's detriment. If it hadn't been suggested to the Tagmatine government already, then perhaps Eugenios would have to bring it up at the next meeting of the cabinet – one way to improve perception of the Tellosanoi would be to have some carefully edited versions of these works make their way out for public consumption. It was getting late and he could tell his guest was quite exhausted. Mathon listened attentively to Eugenios. The Praetor suspected that his rhetoric was more the place for the Senate floor and not in a private session with the Tagmatine Foreign Minister of all people but after all, the onus of intentions was firmly in his court to persuade Eugenios of his sincerity on the matter. He was content in knowing that formal recognition of the two nations was possible. "Ah yes," he remarked, "our practice," he paused, "is not what it once was. The number of enslaved people is at its lowest point in over 300 years. "The Phi'Tlaru has kept me informed of the Emperor's proclamations on our practice, not specifically towards us per se, but on a global level but I can tell you that I am keenly aware of its...unpalatability abroad. It is on the way out. The current generation is the last to be tied, every generation before them, by and large, have been freed to end a political crisis between the high and common classes several decades ago. I foresee a major paradigm shift on the matter in the coming years for sure." Mathon had hoped his response was sufficient enough for the time being. "I feel that we've made a major step forward between the Empire and the Republic," he said, "Senators Pranana and Vrandet will work with you and your staff on the details of the arrangements. As he said that, he had thought about opening the exchange further - if you feel there is enough of a reason to expand the opportunity for those beyond academics in regards to our exchange conversation, I am not opposed to it -- I only suggested a measured approach because of only how far we've gotten and how much further we have to go. But I trust yours and Pranana's judgment on this, but for now, I think we've talked enough for one night. There is much to reflect and contemplate on" he said, walking over to the door and summoning one of his servants. The Tagmatine minister's guards were still outside the room they had been talking to. "Please bring the Minister to his sleeping quarters for the night," he instructed. "Yes sir," he responded. "Please follow me..."
Although that statement did sound like he was trying to dictate policy to the Republic, that certainly was not the case. Eugenios was glad to hear that the practice of slavery was on its way out and, ultimately, he imagined that he would have to get the precise numbers and statistics from the Rihannsu before his time in the Republic was over. It would be useful to have the numbers on hand and the proclamations involved, to show that slavery was declining and no longer a force in Rihan. Some of the more hot-headed members of the press and even the Church had recently called for military action to follow on from the statement against slavery and economic action against Derthalen. That crisis had cooled for the moment, but Arhomaneia was definitely not the only nation that found slavery quite so unpalatable. Personally, Goulielmos would not be surprised if a war against Derthalen was not on the horizon. It did not seem that they had been brought to heel like most hoped, and they were nowhere near as sensible as the Tellosanoi when it came to seeing which way the wind was blowing. Partially, the Megas Logothetes was also curious as to how this political crisis would have been solved by the release of slaves – maybe the fact that they could be cheaper to employ than free men, by releasing them, they were no longer competitors to the lower classes? That didn't sound all that right, even though economics and social history were not really his strong points. He would have to ask Terix if he could take a book on Rihannsu history home with him but Eugenios fear that it might have to be something simple, almost a child's primer. It would be good to know how they viewed themselves, especially if the Empire and the Republic were going to have – hopefully – closer relations in the future. One of many, sadly, for the Tagmatines. Naughty children who didn't want to go to church got snatched by Tellos. Naughty children who stayed out playing after their parents called them got snatched by Skiithiroi, the horse-tribes. Naughty children in the west of Arhomaneia who didn't listen to their parents got snatched by the Haru. That last one had more than a little grain of truth to it, but Goulielmos guessed that it hadn't happened in years. When the Praetor stood, so did the Tagmatine. For today, the meeting was over and Goulielmos had been effectively dismissed, although it would be impolitic to acknowledge it as such. As well as damaging to the occasionally monstrous amount of pride that the Arhomaioi had. Despite the informal air of the meeting, the Megas Logothetes was still a guest of a foreign head of state at the heart of his nation. The balance of power, should Terix had chosen to carry the meeting in that manner, was entirely in his hands. However, the Praetor showed himself to be of a rare breed of national leader with the way he had conducted it. Very few other heads of state would have allowed hours of unfettered access of the like Terix had done. The Agios Basileos almost certainly would not have, even with someone who might have come close to being considered an equal, such as the Empress of Orioni. Their styles of ruling, as had occurred to Eugenios before, were very different. “I shall bid you goodnight, Praetor,” Eugenios sresponded as he was walked over to the door. He gave Terix a half-bow before leaving the room. 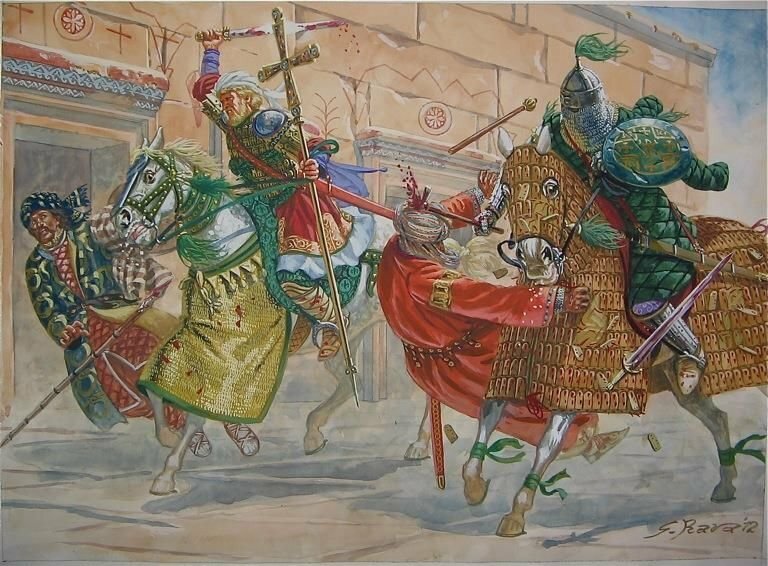 Outside in the corridor, he gave his guards a nod of his head and they fell in behind him as the Rihannsu servant led the way towards the rooms of the Arhomaniki delegation. The sound of the soldiers' armour clanking behind him didn't disturb his thoughts. It was a background noise, one that anyone who spent any time in the Imperial Palace Complex grew used to quite quickly. And there was certainly much to think about for the evening. The Praetor was right about that. It had been a long day and the Megas Logothetes would have liked to have gone to bed as soon as he was in his room. However, Eugenios was going to write up notes for his monarch before he went to sleep, as well as find out what the aides had been doing in the meantime, and what observations the soldiers from the Ikanatoi and the Arkhontogennhematai had seen. Kommodos would certainly want an account of all that had been said between the two. The Tagmatine monarch had the same wish as the Praetor, that the relations between Rihan and his nation would normalise, for the first time in eight hundred years. It would likely be foolish to do it later and, even though he was tired, it was better to do so whilst fresh in his mind. Rihannsu politics is a dangerous game. Formal coalitions existed in the chamber, but their membership was always in flux, a senator cooperating with Jaridan one day may be helping the far-right Jol Tan the next. Every move, every vote was carefully taken, not so much for the masses they represented, but for their own personal self-interest and desire for further influence and power amongst their colleagues. There were 300 of these individuals, of both genders, seated in the round Hall of State, at the very heart of the capital. Presiding the Senate was none other than the Praetor, the effective head of state of the Republic. They had near-dictatorial power, such authority was the dream of every senator. Most would never get it as many Praetors were highly popular both with the military and the lower classes and taking action upon them could potentially lead them to political suicide. Praetors, on the other hand, may have had considerable leverage over the senators, they were not sacrosanct. Two Praetors had been assassinated within a three-year period because of their intended policies had tilted more so in favor of the commoners than the aristocratic Senate was willing to accept. The recently appointed Terix knew his position was tenuous at best. He was secure in the knowledge that he had the support of the military and a slim majority of the chamber to get some of his policies adopted, but it would be folly of him to assume that he absolutely safe. Prior to his appointment, the now-Praetor, he was an Admiral in the Navy. He suspected his appointment to the highest position was merely one of keeping the factions in the Senate in a temporary truce while they evaluated their next moves following the dual assassinations of Praetors Vrax and Gaius. The Praetor's Palace complex was across the Forum of Caliax from the Hall of State. One of his servants had put on his formal toga of state. He looked out the window and saw that it was another sunny day over the capital, Dartha. Two Praetorian Guards entered the chamber he was dressed in and escorted him to several others waiting for him for the walk across to the Senate meeting. As he descended one of the marble staircases, his advisor and confidant Miral Avelik, stood ready to meet him. "Daise (foremost), I have been informed that a small majority of senators exists to pass the law on implementing the establishment of a food program for low-income citizens in the capital," he reported as the two exited into the central courtyard of the complex, Praetorians surrounding them. "Avelik, which senators were the holdouts who finally joined?" he asked while they approached the gates. "Senators Hexce Amarok, Vaebn Lareth, and Gathan Darok." The group had now emerged from the Palace and into the buzz of activity that was the forum. It was another day of normalcy in the capital. The walk between the two buildings would take no more than four minutes. "Darok you say?" he questioned, "he's certainly been very generous lately," he mentioned to his aide. "Do you want me to get someone to keep an eye on him?" "Not yet." He said quietly as they approached the steps of the Senate. "Inform the senators that they have my gratitude that they would support this common-sense proposal." "Yes Daise," he acknowledged and allowed the Praetor and his guards to ascend the steps and through the main door into the round building. Miral would proceed to complete the task given to him. He would enter the building from a side entrance and try and look for them. A bell rang, signaling the start of the Senate session, keeping the aide from doing his job until the conclusion of the session. Senators began streaming into the chamber, taking their seats. The Praetor took his seat upon the Eagle Chair, eyeing the room. On the right-hand side, he could see Senator Gathan Darok, the second-richest man in all of Rihan taking his place. Darok's family was not initially aristocratic. Rather, they bought their way to influence. The family possessed many thousands of melakols (acres) of farmland on the Aihai outside Dartha, growing vitally important wheat. His grandfather had invested the wealth generated from it to purchase two profitable iron mines in the D'Kalla Mountains. Between the farms and the mines, he possessed tens of hundreds of slaves. Garthan's father, Kaol, had converted their wealth into power. When Aerv Nanclus passed away, his seat opened up. Kaol would spend hundreds of thousands of Chaks in bribes to several senators with clout over the Continuing Committee to get himself appointed. Just after he was formally confirmed by the committee, he passed away. In recognition for his dedication to the state, the seat was allowed to pass onto his son, Gathan. He was not content with his family's holdings when he became the head of the family and immediately went about gaining another hundred thousand melakols of farmland and more slaves to cultivate the fields. Using the new land, he would curry favor with the military to make him a preferred provider of foodstuffs to the army, giving him a tidy profit. As his fortunes grew, he decided to exchange it for influence. He alongside two others close to him would pool their money into bankrolling much of the Festival of the Republic, including a 15,000-person banquet and five days of entertainment in the Orventis Arena. His decision to back the Praetor's plan to provide food for free to many low-income people in the capital was just another step. The latter ran up against the more 'free' market elements of the Senate, abet 'caring' for the people, the Nej'ahar. Terix then turned his gaze to the upper left benches where he could make out the beautiful Liviana Charvanek. She was gorgeous, attracting the attention of many male senators and nobles outside the chamber, attempting to get her attention. The Charvaneks were a noble family, tracing their lineage all the way back to the Arrival. They were the rulers of the city-state of Calanista, the heart of Rihan's wine country. At the conclusion of the Clan Wars, they decided to accept the dissolution of their 'absolute' power over Calanista, and submitted to unification into the rapidly forming Republic in exchange for being given a Senate seat, a seat they've had within the family since their signing of the D'Vatta. Although not as wealthy as Darok, her family did retain control of a substantial vineyard and attached villa on the outskirts of Calanista, as well as a smaller urban villa in Dartha. Over the generations, the Charvaneks would be patrons of the arts and education, sponsoring the construction and eternal endowment of the Beryk Institute, the greatest school in the Republic. Other members of the family over time had been dedicated officers in the military, and every second son in the family had maintained a full career in the service. Liviana did her required duty but serving long was not in her interest. Liviana had lived a pampered life, and due to her family's fortune, she never needed to work. She was given the family Senate seat when her mother Isha decided to step down to enjoy the final years of her life in the countryside and her father decided to not take it as he had just completed his fourth tour in the military, wishing to join her in retirement. Since joining the Senate, she would use her beauty and charisma to get what she wanted. In regards to the proposal on the docket at the day's session, she was fully onboard with it. The Charvaneks had been firm members of the militant Jaridan, the largest coalition, urging for greater expansion of the military for defense and always seeking opportunities to grow the territory of the Republic further. Liviana would bolster her feminine advantages by invoking her family's respected military history when needed. The Praetor once again turned his attention to the middle of the chamber. Sensing that most of the members were in the room, he motioned his Praetorian to bang the bottom of his Litesh polearm against the floor several times, calling for order. "This session will now come to order," Terix said. He readjusted himself in his seat before continuing. "The matter before the Senate today is for the allocation of monies sufficient for the implementation of a free food program for low-income citizens here in our glorious capital.." For over an hour, senators would generally speak in favor of the motion, including Darok and Charvanek. The Praetor listened to every word they had uttered. The speeches would eventually cease and a division would be called for. It would pass 154-146. Upon hearing the result, Darok was the first to stand and clap, not to be outdone, Charvanek, joined in as did the rest of the individuals supporting the motion. Both gave glances at each other and then at the Praetor as they clapped. They both wanted the Praetorship, by whatever means. A lunch recess had been called, lasting an hour, before they would return for an afternoon session on matters related to foreign affairs. The Praetor prepared to leave the chamber with his Praetorians, both senators would approach him just as he had reached the door and commended him. He thanked them and continued on his way. Gathan and Liviana looked at each other once more, coldly, before leaving the Senate chamber. Rihannsu politics is a dangerous game. OOC: As you will see concerning the date, this will take place following events yet to be played out in the "In the Shadows" plot line but I wanted to set it up now for when the time comes. Also, if people have ideas or designs for a personal seal for Morror Kassus going forward that I can use, let me know. Amosarr is Rihan's sole manufacturer of railway locomotives and rolling stock, established following the Senate's declaration of financing a substantive high-speed and conventional rail network throughout the Republic as a means to combat rising traffic congestion between the capital and the provinces. Although the Republic has only just begun to get serious about rail as a mode of travel, it recognizes that it is a space that is ripe for innovation in both fabrication and design. The areas the company has rapidly gotten involved in include electric locomotives, single and double-decker passenger cars (plus sleepers, baggage, and dining cars), subway cars, and assorted freight wagons. Amosarr's manufacturing facilities and offices are located in Vribera. Talasagam Rheilhhu Rihana: Up to 2,100 assorted passenger cars with an additional option for 3,450 more. 52 S-Class High-Speed Trainsets. Up to 15,210 freight wagons of assorted types. 384 electric locomotives running on AC power. Built for use on 7 ft. Broad gauge. H'sarin: 60 V-Class Metro Trainsets for Purple Line, expected to build an additional 210 trainsets for remaining lines and increased service through 2028. Built for use on 7 ft. Broad gauge.